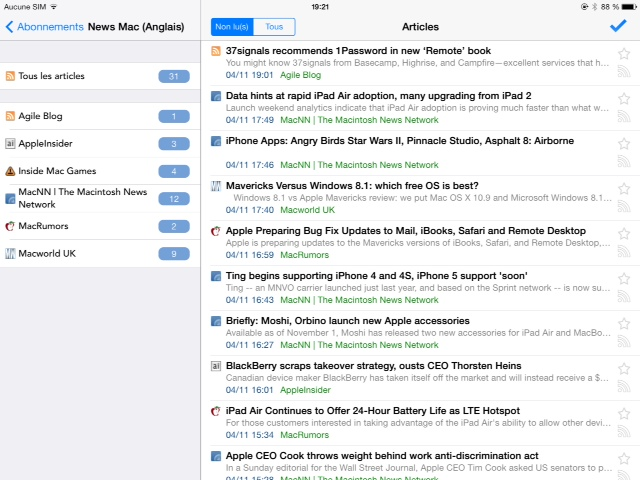 Click into one of those feeds from your screenshot, you see the list of articles within those special feeds. But they all look generally the same. It's just nice to have the favicon shown. Adds a bit of colour, and it makes it quite easy to scroll down the list looking for specific feeds. And yes. It *could* be my setup. But I've got the latest app, and my webserver definitely logs the double slash. Never seen anything else ever do that so I'd be inclined to think it's the app. Ok, I've checked my code and it seems that the '/api' instead of 'api' are still there. Don't known why, but I'll update this in the next release. Ok for the icons, but it needs some works and I need to look how to retrieve them with the API. The app looks great. Much like the one I envisioned but haven't had time to build yet. One major problem: the app crashes every time I navigate to a list of articles, for any feed. I can view categories and feeds with unread counts, but tapping a feed to access the list of articles crashes the app every time. Any way I can help you figure out what's going on here? According to the thread, there's a bug in the 1.9 API for GetHeadlines which doesn't return an excerpt. I've made a fix in my code but I've not yet submit the fix to the App Store. However, if you upgrade you ttrss instance (or a least the API part), this should be ok. You can also wait for the update of Tiny Reader RSS. Tiberius wrote: Ok for the icons, but it needs some works and I need to look how to retrieve them with the API. Not sure if there are any functions or not in the API for this. But if not I guess all you have to do is get the feed ID number and then use the tt-rss installation URL with /feed-icons/<number>.ico. Excellent. Thanks for adding the oldest first option. Thanks, icons will be in the next release. icons_url can also be absolute btw and point to a different server / location. I'll add this to the wiki page when I'm bored enough. Woo! This is excellent now. Thank you for this! The icons make it so much nicer to use in my opinion. Adds a bit of colour. Notice the %20 in the user agent of the top request. I guess there's an escape in there that doesn't need to be. The user agent is provided by the sdk I'm using (AFNetworking) so there's probably a problem when app has a space in it's name. I'll check that. Hide the article when tapping elsewhere. Basically I suggest to mimic the App Store app, once you tap somewhere other than the article's window, the window gets hidden. (Similarly in the App Store, the application you have chosen disappears when you tap elsewhere). Mark above as read. The web interface of tt-rss already implements this and I find it really useful. I love the fact that as you scroll it doesn't auto mark as read - if I want to do that I just "mark all read" - sometimes it's nice to scroll through on the app and leave stuff unread for later on a computer. Unless I misinterpreted what you said.